Learn to shape and maintain 6 basic tools: spindle roughing gouge, diamond parting tool, dome scraper, bowl gouge, spindle gouge, skew. Class outline HERE. This hands-on class teaches the basics of sharpening and setting up a sharpening station. There will be 2 students and a coach at each of 6 sharpening stations. This class is for those still learning sharpening. 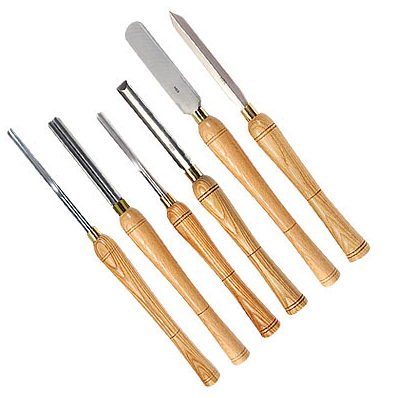 We will teach one sharpening method and one set of toolshapes. We will sharpen the club's Youth Training class tools and use the Oneway Wolverine sharpening system. Bring your personal bowl gouge if you want to reshape it to a general purpose 60° fingernail grind. Contact Jerry Hall jerhall@me.com with any questions. See Map Here for location of class.